On April 24th, Alayna’s mother, Amy, went to see her obstetrician after she noticed some slight bleeding. Her OB/GYN saw that Amy’s cervix was irritated and prescribed antibiotics. That night, Amy started experiencing body shakes and a high fever. She was immediately rushed to the hospital where doctors discovered she was having contractions. At only 25 weeks pregnant, this wasn’t the news that Amy and Aaron expected. 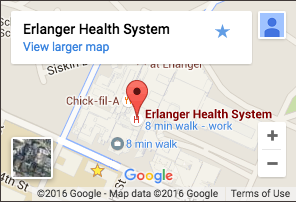 Amy’s OB/GYN recommended that she be transferred downtown to Erlanger Baroness Hospital. With the pregnancy now diagnosed as high-risk, doctors put Amy on antibiotics and morphine to ease the pain she was experiencing. After numerous attempts to stop the bleeding, they determined it was time for Amy to deliver. Only 24 hours after the frightening ordeal began, Alayna was welcomed into the world weighing 2 pounds and 1 ounce. After 104 long days and nights of neonatal care, sweet Alayna was able to go home with her parents, weighing 7 pounds and 7 ounces. She is now healthy and thriving! “Alayna was just in a hurry to get here,” Amy adds. Truly a miracle.